Don Juan Pond isn't spooky so much as it is surreal. When we flew in by helicopter, we could barely see that it was there. Then after we landed the light hit it just so, and the water seemed to appear. 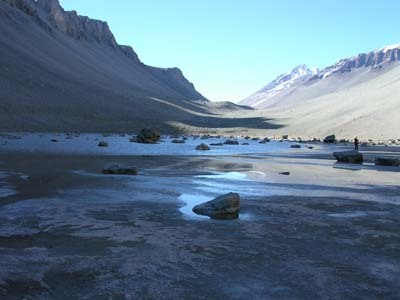 The pond and surrounding area contain rocks carved into fantastical shapes by wind-blown particles of ice or stone. These rocks, which are known as ventifacts, give the place the curious look of a sculpture garden. 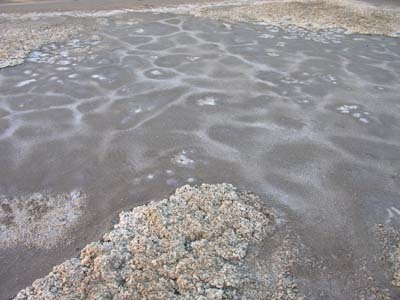 Salts left behind by evaporated water create oddly beautiful patterns on the ground. 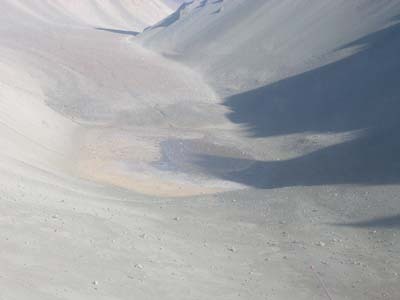 Perhaps the strangest feature of Don Juan Pond, though, are the small waves that ripple across its entire surface. The other water bodies we'd seen were covered with ice except for relatively small moat areas that developed along the edges as the summer progressed. Don Juan Pond, in contrast, was pure liquid.The fact that the pond is much smaller and shallower than the lakes we'd been visiting could have something to do with that. Municipalities sometimes sprinkle salt on roads during the winter. By lowering the freezing point of water, the salt increases snow melt and helps prevent the formation of ice on the roads. But even during the height of the Antarctic winter when air temperatures drop to -50 degrees Celsius, the pond remains at least partially unfrozen. This is because the pond is quite salty, and dissolved salts lower the freezing point of water by interfering with the bonding among water molecules. 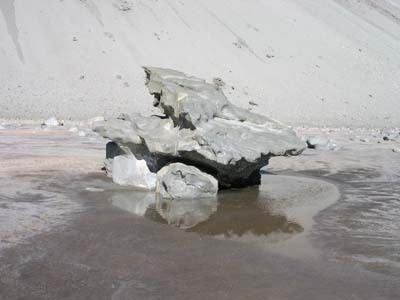 The pond contains so much salt in fact - some 10 to 15 times that of normal seawater - that it is thought by many to be the saltiest body of water on earth. Don Juan Pond was discovered in the South Fork of the Wright Valley in 1961 during field reconnaissance by a U.S. Navy helicopter. The pond was named after Lieutenants Donald Roe and John Hickey, both of whom were members of the first field party to study the pond.